The majority of this the information was not found on conservative sites. That should tell you something. This list will be updated as needed, and it will be divided into categories as to make it easier for updates as they come in. Jamie Gorelick a.k.a. the Mistress of Disaster has been cited in a few places as a ‘key mentor’ of Garland’s. Despite all of that, Gorelick was considered in 2011 for heading up the FBI. Only two cases regarding Gun control can be found. In 2007, Merrick voted to rehear a case concerning a restrictive handgun ban, which had been struck down by a D.C. Circuit panel of judges. The petition was unsuccessful. Garland voted with Tatel to uphold an illegal Clinton-era regulation that created an improvised gun registration requirement NRA V. Reno (2000) regarding the audit log or database of possible “federal registry” of gun purchasers. National Rifle Association took the Justice Department to court, arguing that the regulation was in clear violation of the law passed by Congress. But Merrick Garland ruled in favor of the government, finding that the Justice Department’s interpretation of the Brady Act was fair. Judge Garland cases regarding Federal agency’s and entities seem to show strong views in favor of the government. According to SCOTUSBlog, he sided with the federal agency every time. (Garland, J., dissenting in part) (dissenting from majority opinion upholding industry challenge to part of EPA’s anti-haze regulations), after remand Util. (joining opinion of Silberman, J., upholding interpretation of Social Security Act; over dissent by Sentelle, J.). Merrick may be the 5th SCOTUS vote to make sure Obama’s Climate agenda stays alive. Garland Was The Lone Dissenter In 2002 Ruling That Struck Down EPA Regulations. “The Environmental Protection Agency must rework part of its regulation to cut pollution in national parks and wilderness areas, a federal appeals court said Friday. The EPA rule issued in 1999 requires states to take action to reduce air pollution from power plants and other sources whose emissions drift often hundreds of miles, causing haze and visibility problems in remote areas such as national parks and wilderness. On March 26, in Carbon Sequestration Council, et al. v. EPA, et al., the D.C. Circuit heard oral argument on the most recent industry challenge to an EPA rulemaking related to climate change. The petitioners claim the EPA exceeded its authority when it interpreted “solid waste” under the Resource Conservation and Recovery Act to include carbon dioxide sequestered underground using geologic injection. Both sides faced rigorous questioning from the three-judge panel, which hosted Chief Judge Merrick Garland together with Judges Janice Rogers Brown and Harry Edwards. On balance, the petitioners seem to face greater skepticism both on the merits and on their standing. Depending on the outcome, the court’s decision could have implications not just for carbon capture and sequestration operations, but also for other enterprises that rely on geologic injection, such as enhanced oil recovery operations and for the EPA’s RCRA program more broadly. Where will he fall regarding GITMO? President Obama intends on closing GITMO and there more than a few reasons to suspect that Merrick Garland would help him in that endeavor. In an article from USA Today: In 2008, he ruled that suspects could not be held as enemy combatants without verifiable evidence. TruthOut.Org:“IAN MILLHISER: Sure. So there was a question then dealing with whether or not Guantánamo Bay detainees were allowed to go to civilian courts or whether they had to go through the military tribunal system. He joined a ruling saying that they had to go through the tribunal system. At the — I believe he relied on a World War II precedent called Eisentrager, which is not a great decision. And that — and then his opinion was reversed by the Supreme Court five to four in the Rasul case. Libertarians may take issue with one of his rulings, as well as Conservatives, who may not care for the GOP Nominee. “Judge Garland’s lowest quality work came in Libertarian Party v D.C. Board of Elections. In 2008, Libertarian presidential nominee Bob Barr failed to get on the ballot in the District of Columbia, but he filed for declared write-in status. He was the only write-in declared presidential candidate in D.C. that year. The Board refused to count Barr’s write-ins, even though in 1974 the D.C. city appeals court (not the federal court) had ruled that presidential ballots must include write-in space and those write-ins must be counted. Article by Rick Hasan from Election Law Blog suggests that Garland would most likely side with the more Liberal justices on election law, however, that Garland may not be 5th vote to over turn Citizens United. Rick Hasan wrote another article back in 2010 for Slate that I just read, and boy is it strangely prophetic. It was written after the Citizens United Decision and it’s titled, Scalia’s Retirement Party: Looking ahead to a conservative vacancy can help the Democrats at the polls. 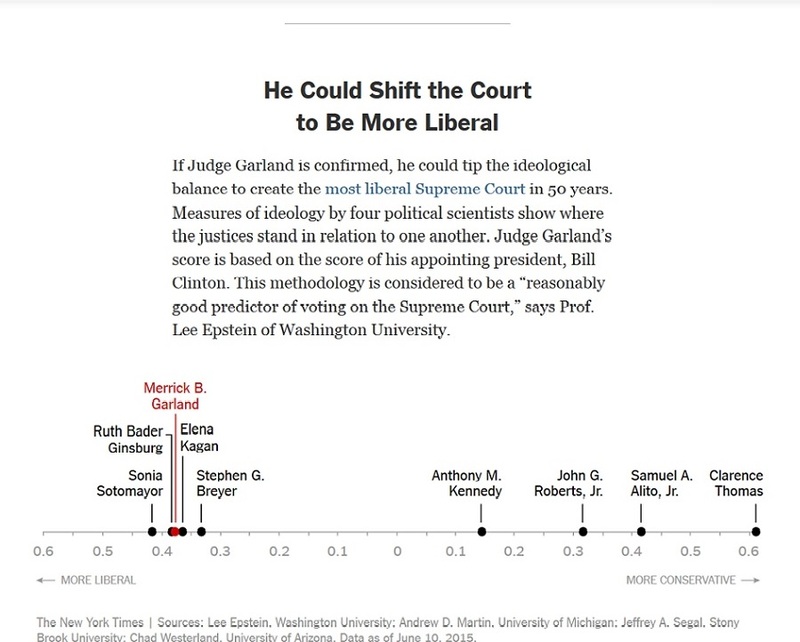 All articles listed below can be found at Scotusbrief.org regarding Judge Merrick Garland and where his ideology may fall. These are just some of the ones under tag Merrick Garland. Truthout.org has reported the following information on Judge Merrick Garland. Center for Public Integrity has the following investment information for Judge Garland calendar year 2012. This section will be composed of articles that just don’t fall under any of the issues at hand. This entry was posted in Liberty Speaks, Obama, SCOTUS and tagged Merrick Garland, SCOTUS. Bookmark the permalink.